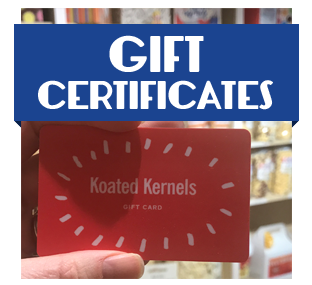 Great gift, Koated Kernels Gift Certificates are a great gift for any popcorn lover. We offer our Gift Certificates in $10, $25 and $50 options. If you would like the Gift Certificate emailed instead of mailed, please provide the recipient’s email address in the comment section while checking out.